If I seem a little prickly to you, maybe you shouldn’t touch me. It eludes me why I never thought to post the mandalas on Mondays. Not only does #MandalaMonday make a more pleasing hashtag, it gives me an extra day to think about comics without being rushed when I’ve used the entire weekend up having fun and not thinking about the act of creation. This one looks like a sea anemone to me, something that lives on a coral reef. My trip to New Mexico was wonderful and cleansing, but the 7+ hour drive each way, mostly through the mountains, was pretty taxing on my body. I drank one of those dreadful 5-Hour Energies, which kept my mind so relentlessly focused on piloting a vehicle that 7 hours after we arrived my brain remained on alert to the sensation of hurtling through space. Driving that long wasn’t easy on the rest of me either, and I got very little sleep last night. 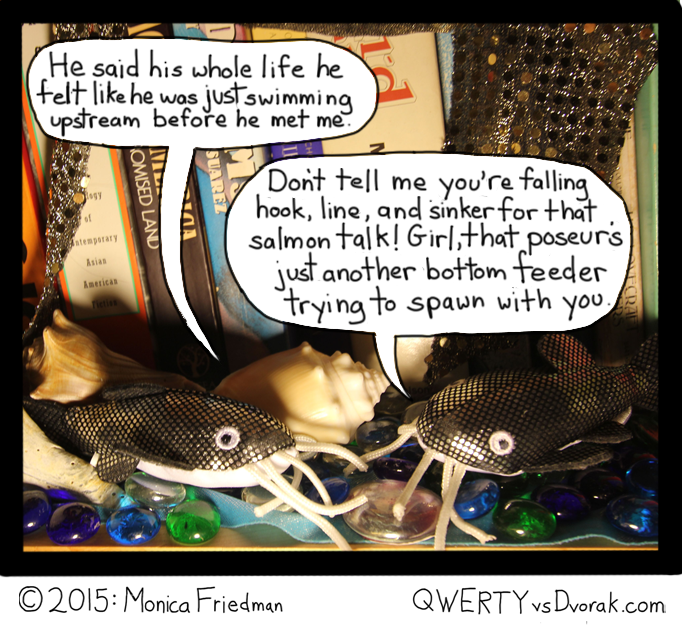 There should be a comic tomorrow, a silly one, and then maybe one of those brutal personal comics about the most painful things that have ever happened to me, which seem to be the ones that most interest readers. 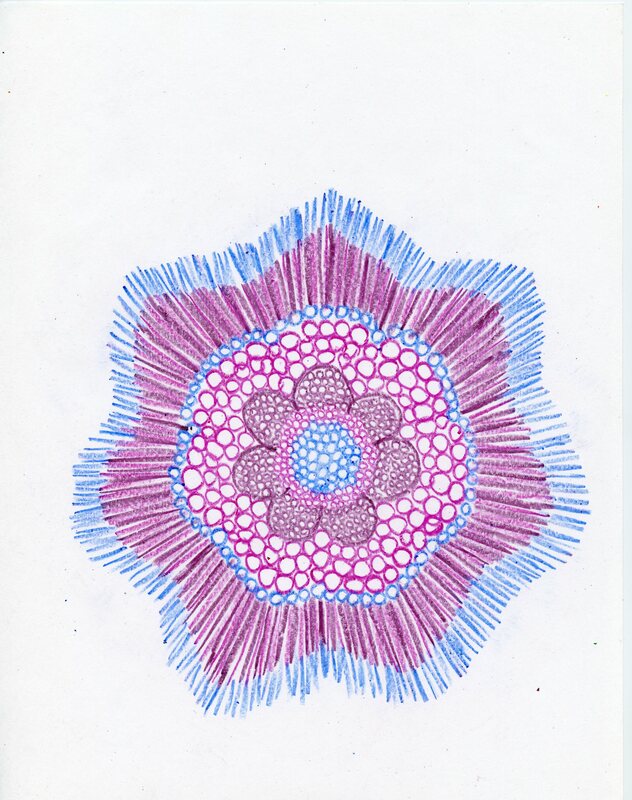 This entry was posted in mandala and tagged blue, comics, fish, flower, fuscia, mandala, purple on August 17, 2015 by littledragonblue. 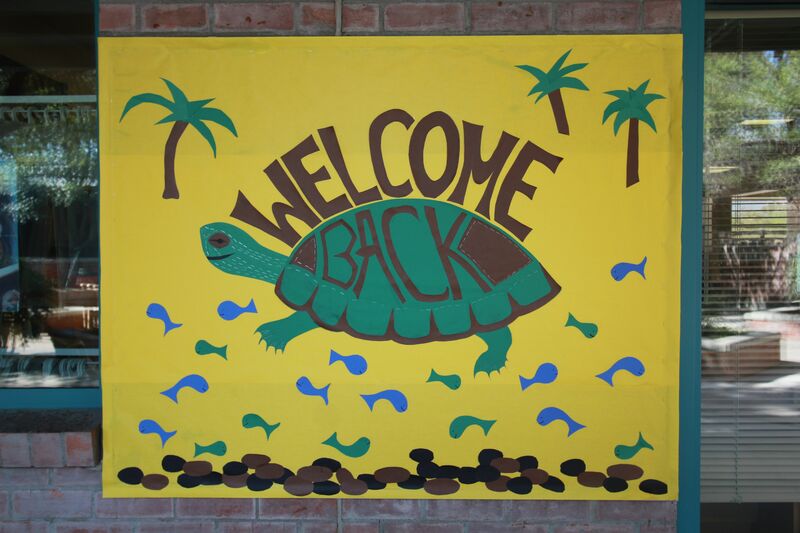 Back to School Bulletin Board: (Another) Turtle! Yep, summer vacation is over. I know I just did a turtle, but this is a different turtle. The green sea turtle is, of course, a saltwater creature, whereas this turtle is a freshwater type. Originally, it was supposed to be a red eared slider, a turtle that is a popular pet and, as a result, one of the most invasive species on the planet, but they are native to this region and not considered a nuisance here. However, I didn’t bring a reference photo of a slider, so what we have here is a sort of generic painted turtle. Painted turtles also live in this region. 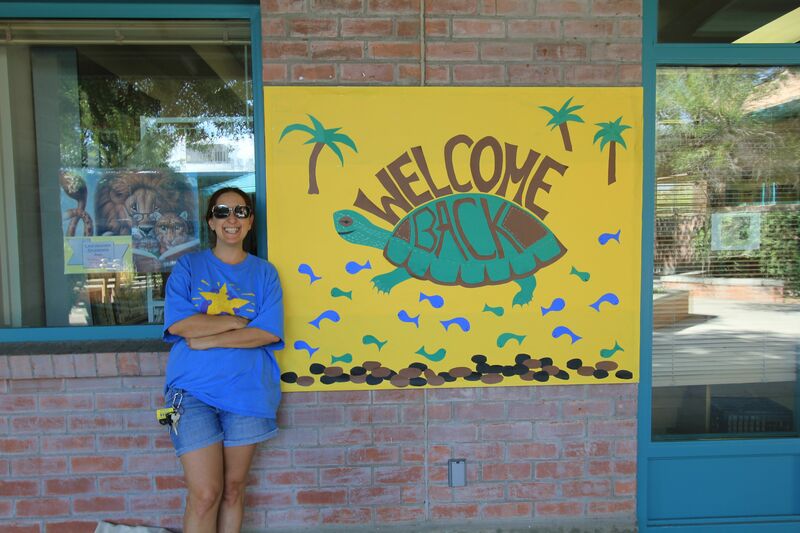 The concept of this bulletin board is from a nearby park called Agua Caliente, where, until recently, natural springs kept everything very lush. I believe the springs have recently dried up, and I haven’t been back in a while, but I’m sure you can still see palm trees, aquatic turtles, and fish there, even if some of the lagoons are drained. Last summer’s design had help up pretty well; it’s always a particular shame to take the old one down when it still looks good, but they can’t really be repurposed, due to the fact that they’re completely full of open staples and therefore sort of dangerous to touch. Plus, there’s no way to rehang them unless you go and bend all the staple closed, and I use hundreds of staples in a typical bulletin board. I get my paper from the source! I think yellow is a cheerful, but unusual background color. I probably would have gone for blue, to better represent water, but they hadn’t ordered any more butcher paper and no blue was to be had. Incidentally, I don’t think I’ve ever shared a photo of this giant rack of paper, from which I get most of my colors. 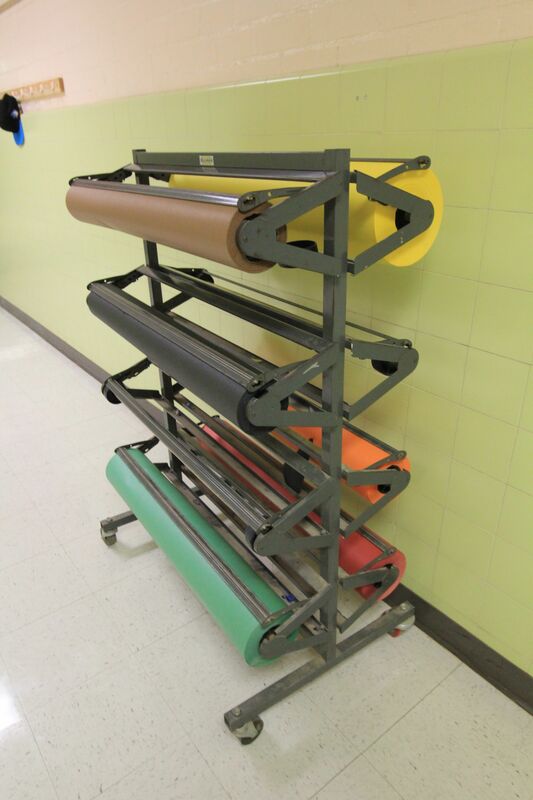 (Some of them–the construction paper colors–also come from the supply closet in the office, but the butcher paper is just kept out in the hallway on this rolling rack. It’s never in precisely the same spot, but it’s easy to find. It took me a while before I could effectively use the (blunt) cutting edge against which you have the pull the paper to effectively create a straight rip. It’s very joyful. Sometimes the kids can get paper, if their teachers tell them to, but for me I still feel a little frisson of power knowing that I can have any color paper I want. Bwoo ha ha ha. Any color except blue, apparently. Measure a lot of times, paste once. I drew the shell first, then traced its edge to get the letters to fit on its back. 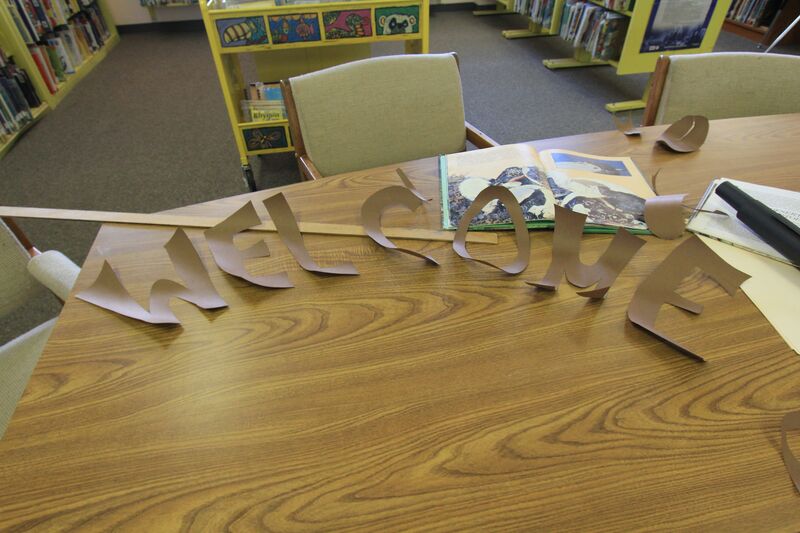 Then I traced the edge again to get the letters to fit on top. From there, I glue everything to the board. It’s sort of a rote operation. I add a few staples for insurance, and then I go back over the design and add a bunch of staples for accent (and security). 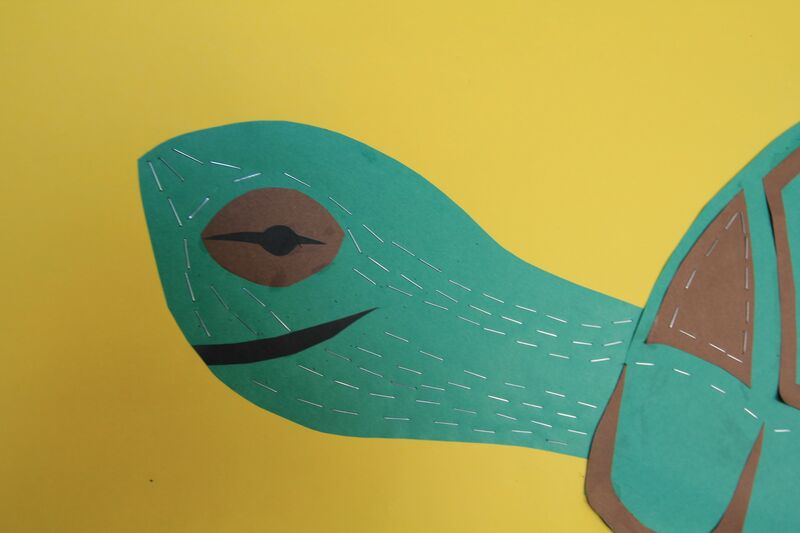 Here you can see how the staples add texture and dimensionality to the turtle’s head. That is a face only another turtle could love. When the turtle and the text were finished, there was still a lot of blank space and the whole thing looked kind of threadbare. 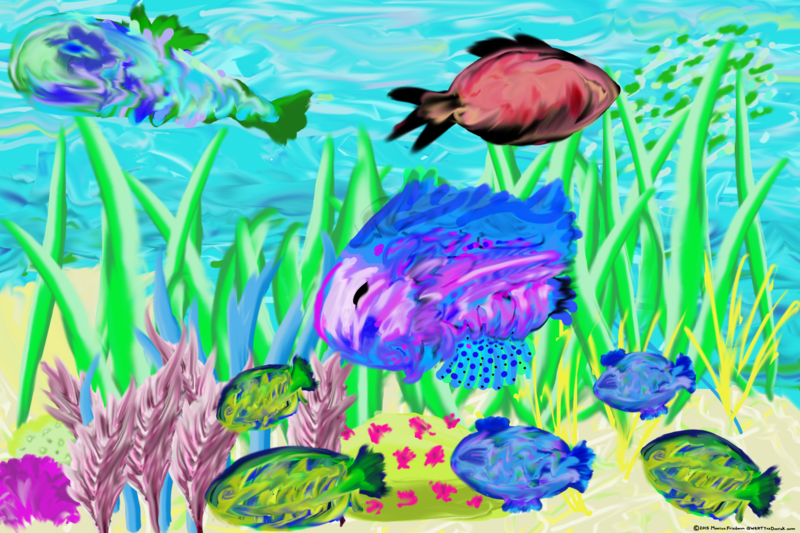 First I added some palm trees, then some fish and some river rocks, and then a few more fish. I go back and glue anything that isn’t lying flat again. Truthfully, I meant to start this yesterday, but instead I spent the entire day obsessing about how filthy my office was and totally forgot what I had planned to do. Needless to say, I have not yet started cleaning my office. However, I have created and uploaded some new art, so my conditions from yesterday were still fulfilled. 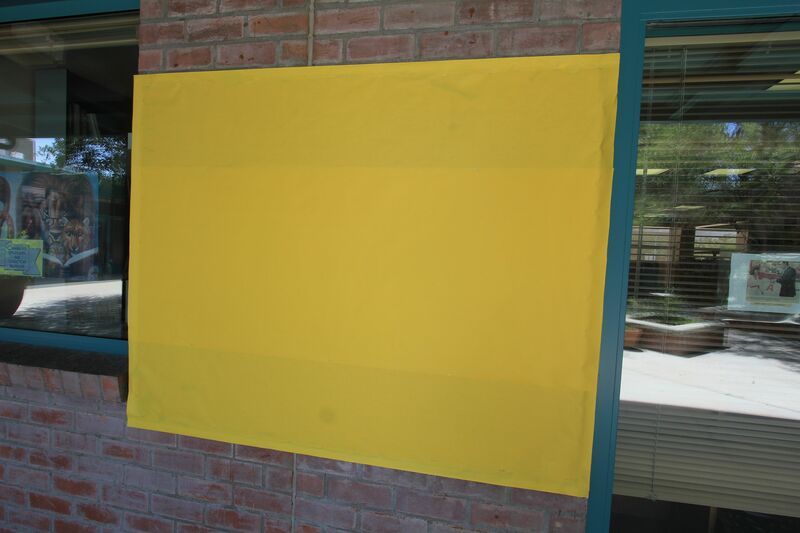 This isn’t my favorite design–it feels like it needs a lot more background–but I only had one day to do it if there was going to be a new bulletin board when the kids came back and it’s 104 degrees out (this bulletin board is outside) and there’s a fire on the mountain, so I feel like the 5 hours I put in today was all I had for this project. It’s cute and it looks OK. So, success. 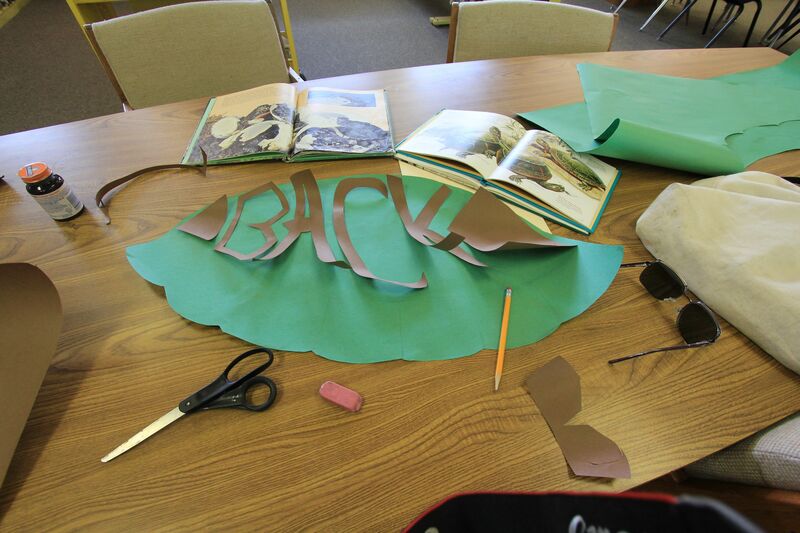 This entry was posted in Bulletin Boards and tagged animals, bulletin board, cut paper, fish, paper, paper craft, turtle on August 6, 2015 by littledragonblue.